It’s common knowledge that the industrial revolution changed the world. There was also a much slower revolution that went on and worked hand-in-hand with it, and this was the change from local manufacturing to the widespread distribution of manufactured products. Industry grew larger, reducing costs, increasing product availability, and largely driving out cottage industry and the custom products they produced. But what about before all that? Colonial America and Europe ran on much more localized economies, with the vast majority of products being made locally to order. Regardless of whether you needed andirons for your fireplace or spoons for your kitchen, you would speak to the appropriate craftsman who would make what you needed. One such village craftsman was the village tinsmith. In a way, the tinsmith and blacksmith were complimentary trades. The blacksmith made articles that required thick pieces of metal, like tools, horseshoes, and the aforementioned andirons. But blacksmiths were limited in their ability to do fine, delicate work. Their tools and methods mitigated against that, so they required the tinsmith and the silversmith to make things the blacksmith couldn’t. Tinsmiths worked with sheet tin and other sheet metals (like copper and brass). From this material, which would have to be shipped to them from the foundry, they would make kettles, cookie cutters, coffee pots, cups, pill boxes, lamps, and an assortment of other useful devices. But tinsmithing didn’t stop with these simple items. Chandeliers and crooked-spout coffee pots were also the work of tinsmiths. The simpler products, such as cookie cutters and pill boxes, were often the work of apprentices while the more complex products were undertaken by the master or by an apprentice who was nearing the end of his training. 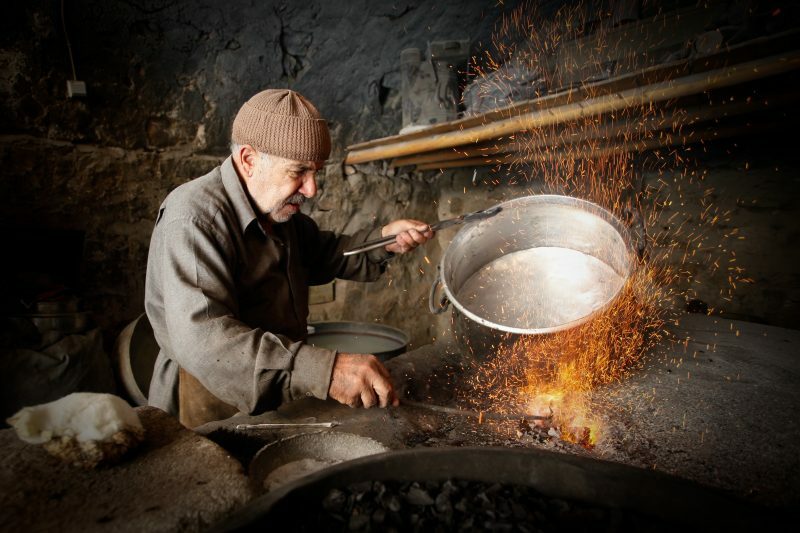 The tinsmith suffered more from the industrial revolution than the blacksmith did because it was easier to convert his wares into mass-manufactured products. Tea kettles and tin cups are fairly consistent objects without much need for customization. It was easy to convince people to buy the factory-made products, especially when they were cheaper than bespoke ones from the tinsmith. A large number of trades use the skills of the tinsmith – from installing rain gutters on homes to making air ducts for HVAC systems. We still have tinsmiths today, even though they are not commonly called by that name. 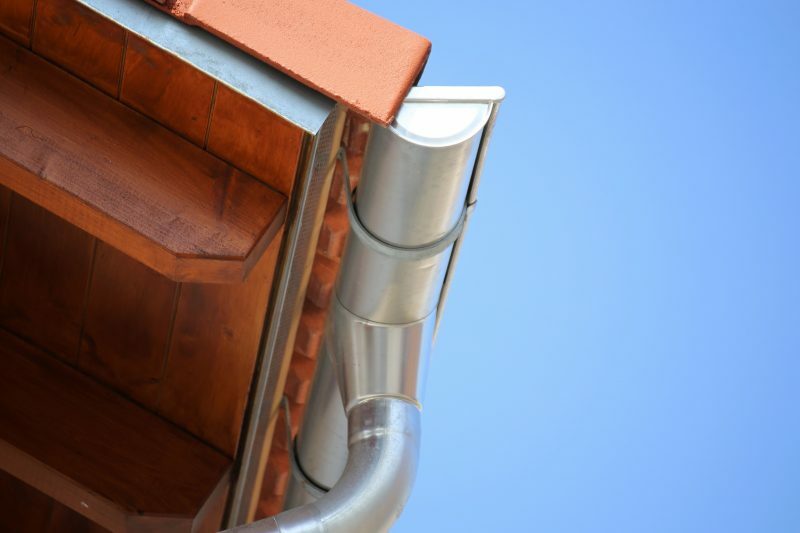 A large number of trades use the skills of the tinsmith – from installing rain gutters on homes to making air ducts for HVAC systems. Pretty much anything that is made from sheet metal, up to the skin of a car, stems from the tinsmith’s trade. As with most other trades, tinsmiths leaned by apprenticeship. Fathers would find a master craftsman and apprentice their sons to them for several years so that they could learn a trade. 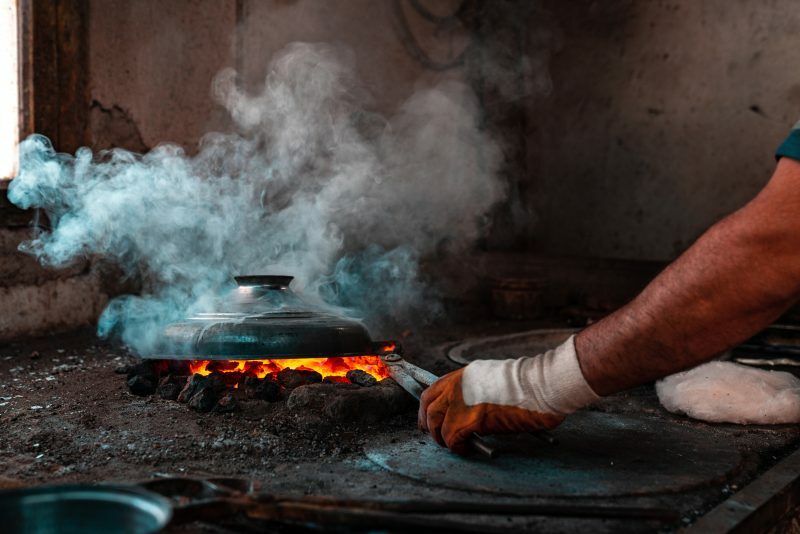 This gave the master craftsman cheap, partially-trained laborers to further their business while at the same time giving the young man the opportunity to learn a trade which would sustain him and his family for his lifetime. The tinsmith’s trade used many of the same tools as the blacksmith – albeit much smaller and without the need for a forge. Thin tin sheets are softer and more flexible than steel and iron so there is no need to heat them to form them. The tinsmith would cut his material with tin snips and form it by tapping it with a hammer and bending it over a variety of different mandrels, which were placed into a socket in the benchtop. Fathers would find a master craftsman and apprentice their sons to them for several years so that they could learn a trade. There were a number of different types of forms and anvils used in tinsmithing, with many of them designed to provide specific shapes. A domed lid for a pill box might be hammered into a hardwood block that had an indentation the desired size. 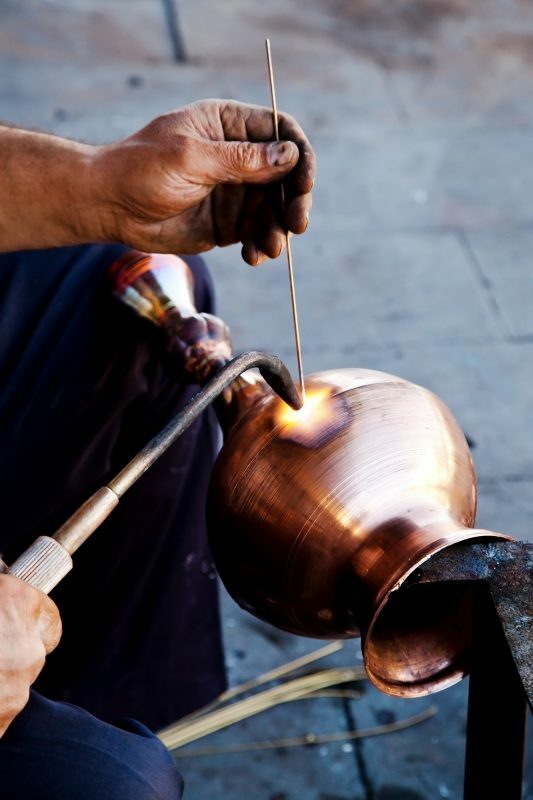 A curved handle for a teapot might be formed over a thin horn, allowing the tinsmith to bend the metal and curve the handle in one single operation. Tapping the sheet metal with a hammer would form it to match the shape of the form beneath it. Moving the part while it was being hammered would allow the shape to be modified, so it didn’t have to follow the form exactly. Decorative pieces could be made either by piercing the tin with an awl (as would be done with a lamp) or by using stamps to make a pattern in the metal, much like leatherworking. Of course, the smith would charge more for this work as it was very time-consuming. The majority of their work was simpler: designed for utility rather than beauty. Most of what the tinsmith made was soldered together, although rivets were used as well. The rivets weren’t the pop rivets of today but rather the kind that needed to be hammered. The rivet would be inserted through the pieces to be joined from the inside and then the head placed on an anvil. The tinsmith would then pound the rivet down from the outside to form the rounded head. Soldering wasn’t done with an electric soldering iron like those used today in electronics but rather with an iron that was heated in a small brazier. While irons varied, they were typically about an inch in diameter or an inch square. The heated iron was then used to heat the metal to be soldered so that the hot metal could melt the solder. 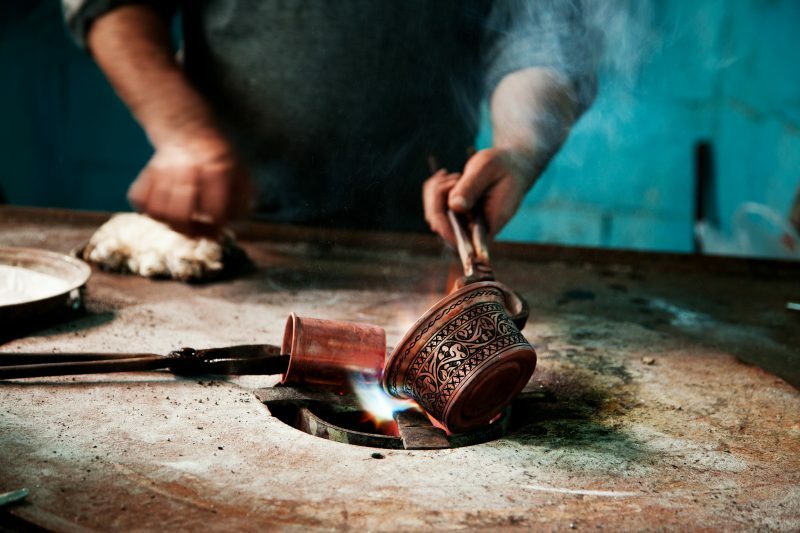 While the actual trade of tinsmithing has been lost, much of the methodology still remains. You might have trouble finding the various types of forms they used but you can find breaks, rollers, and anvils usable for forming sheet metal. With them, you can make a variety of useful things. I do a lot of projects in my home workshop. At times, I need metal parts or hardware that I can’t find. 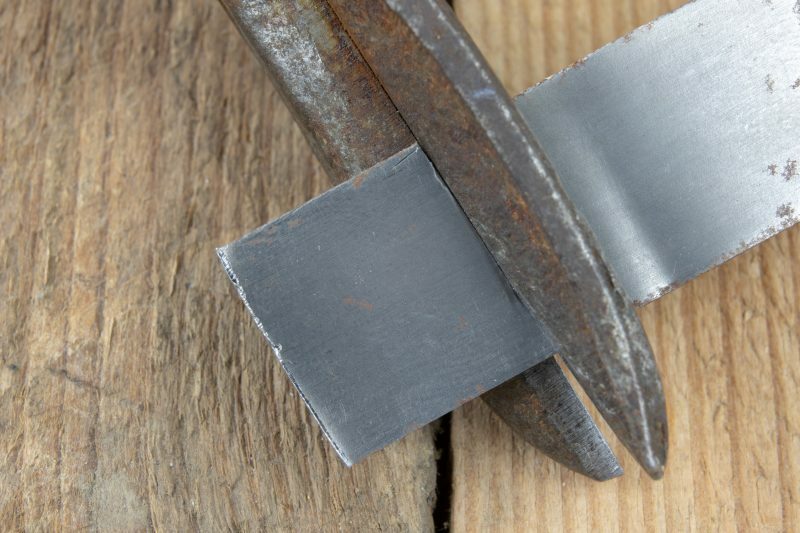 This gives me the opportunity to follow in the footsteps of those ancient tinsmiths by taking various pieces of metal that I have (usually aluminum sheets) and forming it to make brackets, hinges, and latches. In most cases, it is easier to make these sorts of parts out of sheet metal rather than steel strap – as long as the sheet metal is strong enough for my needs. I think it can be safely assumed that in a long-term survival situation where there is a general breakdown of society, it would be extremely useful to have the ability to make various different types of metal parts. 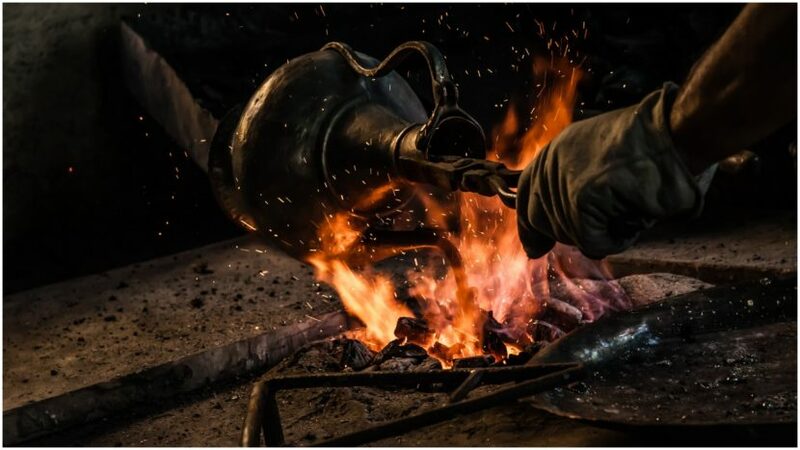 While the tools I have won’t allow me to do all the fancy work that one of those tinsmiths could do, I’m fairly sure that I could make a tin cup, lamp, or teapot if I needed to.